Abby: Just the thought of Jonathan frightens me. Do you remember how he used to cut worms in half with his teeth? Mortimer: Oh, Jonathan? He's probably in prison or hanged or something by now. Cab Driver: I'm not a cab driver. I'm a coffeepot! Dr. Einstein: Where am I? Oh, here I am. Dr. Einstein: We got a hot stiff on our hands! Martha: One of our gentlemen found time to say 'How delicious!' before he died. 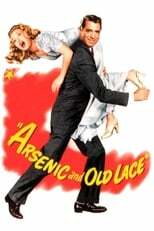 Martha: For a gallon of elderberry wine, I take one teaspoon full of arsenic, then add half a teaspoon full of strychnine, and then just a pinch of cyanide. Police Sgt. Brophy: They're two of the dearest, sweetest, kindest, old ladies that ever walked the earth. They're out of this world. They're like pressed rose leaves. Reporter: Seems like the same suckers get married everyday. Abby: Now Mortimer, you behave. You're too old to be flying off the handle like this! Dr. Einstein: [hat falling across his eyes] Well, I'm off to Panama. Bon voyage! Dr. Einstein: At least people in plays act like they've got sense. Mortimer: Oh, you think so? Did you ever see anybody in a play act like they got any intelligence? Dr. Einstein: [agonizing] How can anybody be so stupid! Dr. Einstein: Johnny, why did you kill that man? He was being nice to us and gave us a ride. Jonathan: He said I looked like Boris Karloff! Elaine: But Mortimer, you're going to love me for my mind, too. Mortimer: One thing at a time! Elaine: But, Mortimer — Niagara Falls. Mortimer: [distracted] It does? Well, let it. Elaine: Well, that's a fine thing. We're married one minute and you're throwing me out of the house the next. Mortimer: I am not throwing you out of the house, I am not throwing you out of the house, I am not throwing you out of the house. Will you get out of here? Jonathan: And now doctor... we go to work! Dr. Einstein: No, Johnny. I cannot operate without a drink! Jonathan: Pull yourself together, doctor! Dr. Einstein: I cannot pull myself together without a drink! Jonathan: Perhaps we should introduce ourselves. This is Dr. Einstein. Jonathan: Yes, a surgeon of great distinction... and something of a magician. Jonathan: I am Jonathan Brewster! Jonathan: Teddy, I think it's time for you to go to bed. Teddy: I beg your pardon. Who are you? Jonathan: I'm Woodrow Wilson. Go to bed! Teddy: No, you're not Wilson, but your face is familiar. Let me see. You're not anyone I know right now — perhaps later on my hunting trip. Yes, you look like someone I might meet in the jungle. Jonathan: Tonight, we are taking care of Mortimer. And just for him we'll have something special. I plan on using the Melbourne method. Dr. Einstein: [cringing] No! Not the Melbourne method, please! Two hours! Mortimer: Aunt Abby, how can I believe you? There are twelve bodies in the cellar and you admit you poisoned them. Abby: Yes, I did. But you don't think I'd stoop to telling a fib. Mortimer: Men don't just get into window seats and die! Abby: Of course not, dear. He died first. Abby: The gentleman died because he drank some wine with poison in it. Now, I don't know why you're making such a big deal over this, Mortimer. Don't you worry about a thing! Mortimer: Teddy's killed a man, darlings! Mortimer: But there's a body in the window seat. Abby: Yes, dear, we know. Abby: Yes, but it has nothing to do with Teddy. Abby: Now, Mortimer, you just forget about it. Forget you ever saw the gentleman. Abby: We never dreamed you'd peek. Mortimer: Teddy, I'd like to introduce you to a doctor. Dr. Gilchrist: He thinks I'm Livingstone? Mortimer: Uh, that's what he presumes.